In less than a week's time, there will be a major LCSG event, which is the King of the Hill ride. For those who are not in the know, it is a ride which brings you up many of the hills along the southern part of Singapore. Some of the slopes include the NUS campus, Kent Ridge park, Telok Blangah heights, Bukit Chandu and Mount Faber. Usually it will be quite a challenge tackling just a couple of these, but when you try to ride all of them in a single morning, this is where the fun really starts! Looking back at the blog post I wrote last year regarding the 2011 edition of the King of the Hill, I was surprised at how much my bike has changed since then! Click through the link to see what I did to prepare the bike for the King of the Hill ride last year. The biggest difference between last year and this year is that I now have a front double system! 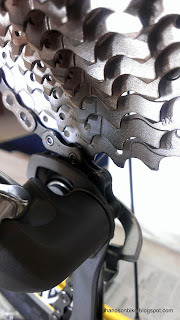 Which means that I have a 39T chainring to drop into when I climb the slopes. 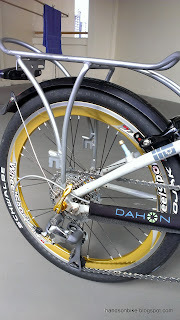 With a 2x10 speed 53/39T and 12-27T drivetrain and 20" wheels, my current gearing is 29" - 88". This is better than what I used last year: 45T front chainring and 12-28T cassette at the rear, with a gearing of 32" - 75". Even so, I still find the Kent Ridge slope challenging, even with a low gear of 29". I have always wanted to try cycling up the slope on a lower gear, and the King of the Hill ride gives me the perfect chance to try out a different gearing setup. Since my engine is not that strong, I have decided to modify the bike temporarily to make it easier for me to climb the slopes. I don't like to stand and mash the pedals when I climb slopes, as it puts a lot of stress on the folding joints. This means I will need either stronger legs or lower gears to pedal up steep slopes. After comtemplating a few options, I realised that the easiest way for me to achieve lower gearing is to use a larger cassette. 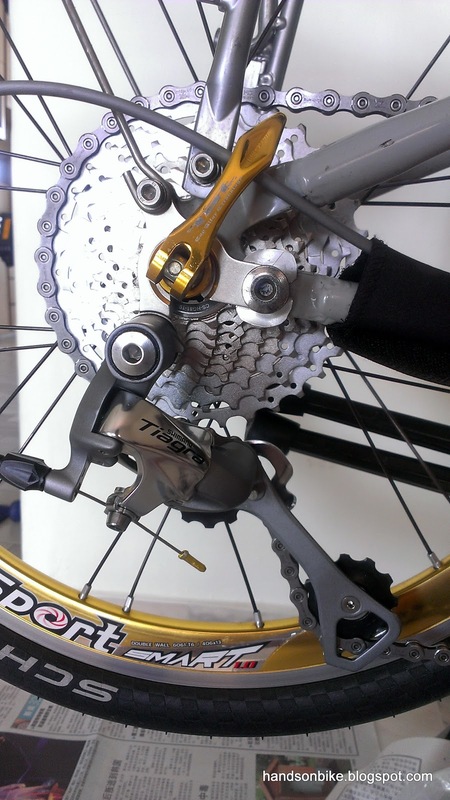 Other 10 speed cassette options would include the 12-30T Tiagra cassette, or 11-32/11-34T MTB cassettes. In the end, I decided to go all the way and change to a 11-34T MTB cassette, as a 12-30T cassette would not make much of a difference. Separate parts of the cassette. The largest 3 sprockets are mounted on an aluminium alloy carrier to reduce weight. 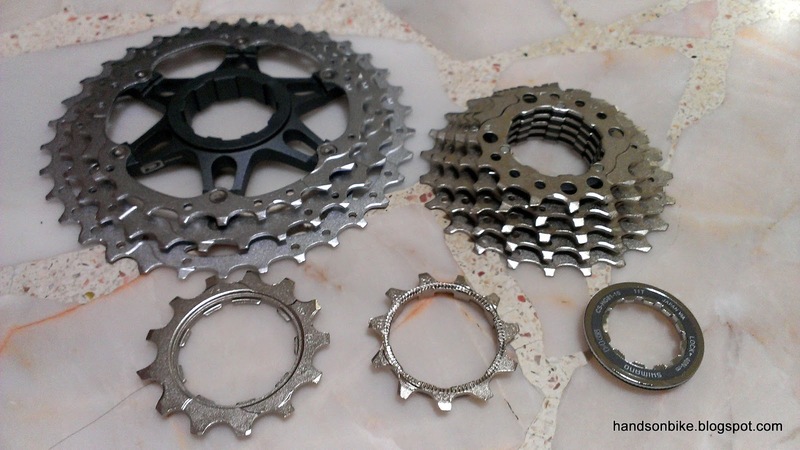 Technically speaking, a road cassette and MTB cassette are quite similar, as the spacing between each sprocket is similar. Thus there is no problem swapping out my road cassette with this MTB cassette. However, it is not as straightforward as just changing the cassette! 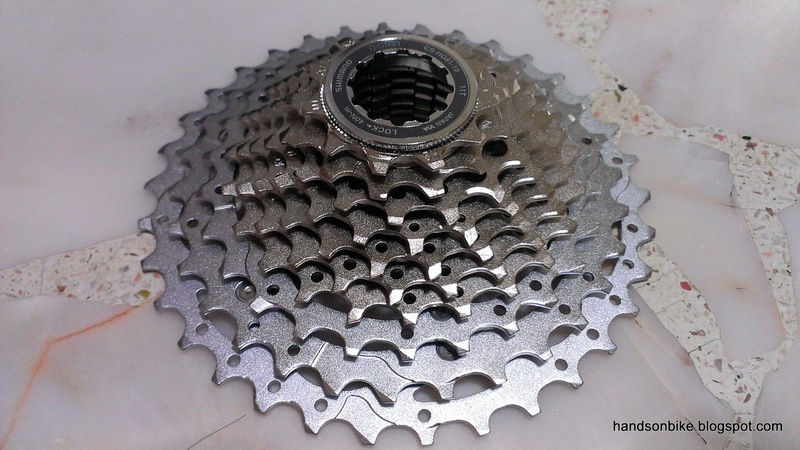 The short cage Ultegra RD cannot be used as it will not reach the large 34T sprocket on the cassette. 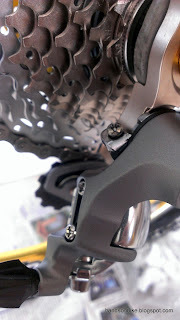 Also, the chain capacity of a short cage RD will not be sufficient to cater for the difference in gears. Therefore, a different RD is required. 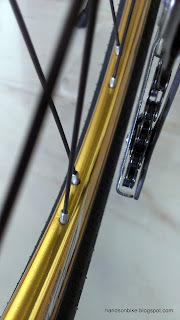 Since I have a road shifter (Shimano 105), it will be best to use a road RD, so that the cable pull ratio is compatible. It is possible to use a MTB RD with a road shifter, but shifting performance will not be ideal as the pull ratios differ a bit. The Shimano Tiagra 10 speed RD was chosen because it is tested to be able to support up to a 32T sprocket. 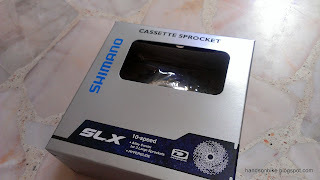 For me, it will be pushing the limits to use it on a 34T sprocket, but I will give it a try. The long cage is needed to absorb the big difference in chain length between the front-top-rear-low and front-low-rear-top gear combination. As I do not plan to use this low gearing setup extensively, there is no need to get more expensive higher end models. A new 10 speed chain is also required as the chain needs to be longer to cater for the larger 34T sprocket. Either a road or MTB 10 speed chain should work fine. 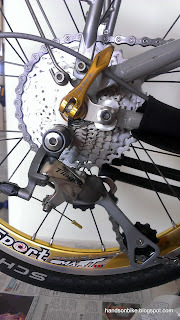 First thing to do is to remove the current cassette and put on the 11-34T cassette. The cassette looks really huge compared to the wheels! A close up of the cassette. 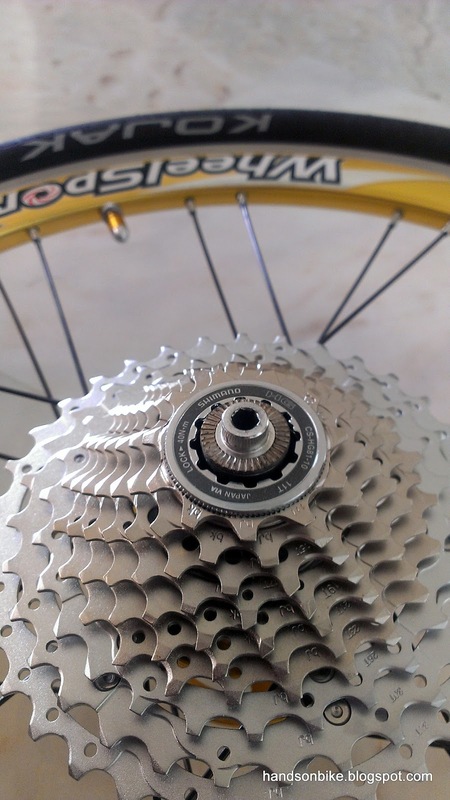 There are larger jumps between gears as compared to a road cassette. 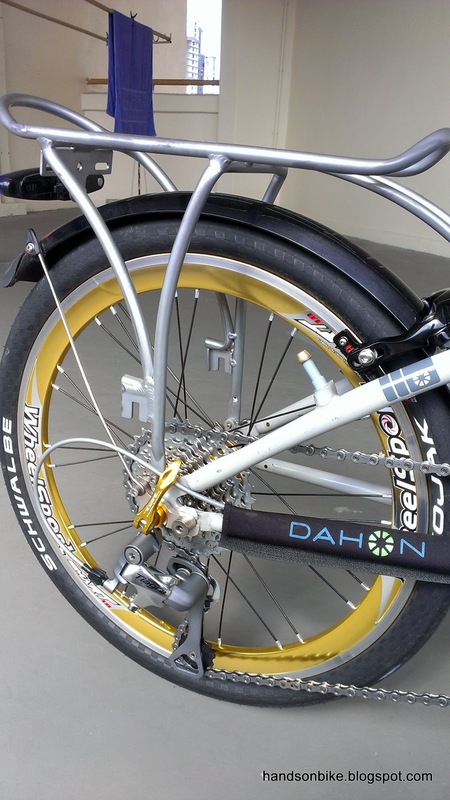 The aluminium alloy carrier to reduce the weight of the cassette. Saves about 90 grams as compared to the cheaper version (HG62-10) without alloy carrier. So far, installation has been pretty straightforward. However, installing and tuning the RD proved to be much tricker (as expected). The main issue comes from the difficulty of reaching the large 34T sprocket, as the RD is not designed to reach such a big sprocket. In order for the guide pulley to be able to reach the 34T sprocket, the B-tension screw had to be screwed all the way in, so as to pull back the RD all the way to allow the guide pulley to clear the largest sprocket. Don't worry if you don't understand what I just wrote, the key point here is that using a road RD on a large MTB cassette is not recommended! A long cage RD is used as a chain capacity of >37T is required [(53+34)-(39+11)] = 37T. With the RD pulled all the way back, this also meant that the gap between the guide pulley and the other sprockets also became quite big. 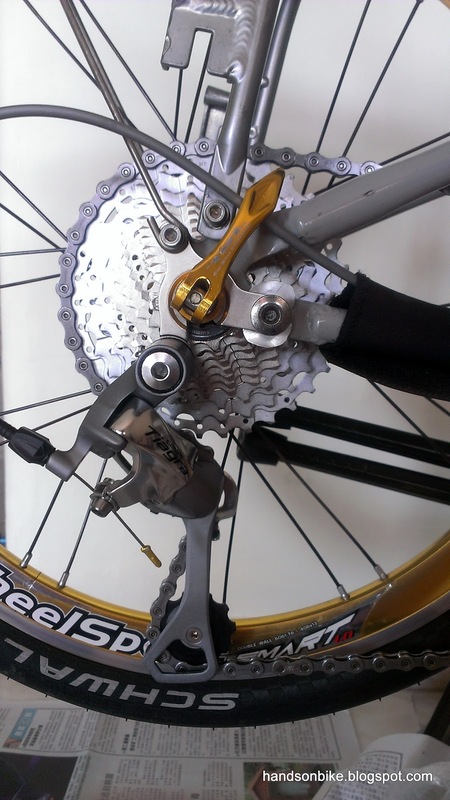 This causes a noticeable drop in shifting performance as the shifting performance is only ideal when the guide pulley and sprocket are about 3mm apart. 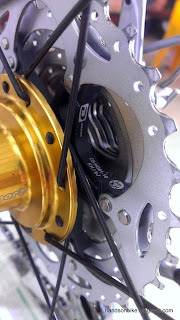 The RD fully stretched, when the chain rests on the 53T front chainring and 34T sprocket. 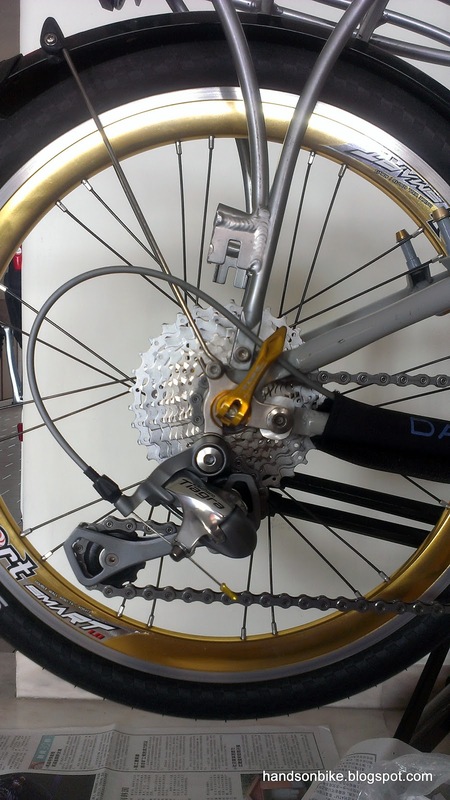 Minimum chain length, when the chain is on the 39T chainring up front and 11T sprocket at the cassette. As a long cage RD is used, this also means that the cage will hang down quite close to the ground in some gears. This is bad for off road bikes where there are many obstacles on the ground, but it will probably not be a problem when cycling on flat roads. RD cage hanging down really low. The RD cage is only about 5 cm off the ground in the worst case. Overall, this new cassette and RD works quite decently, and there are no major issues with this setup. 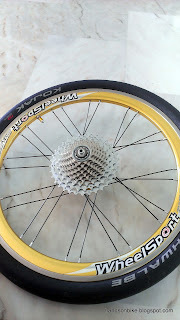 However, it is not recommended for more frequent usage as the gear shifting performance is not the best and the gearing is not suited for long distance road riding due to the gear ratios available. With this setup, my gear range has been modified to be 23" to 96". At the low end of the gear range, the lowest possible gear ratio has been lowered from 29" to 23", and I reckon this will make a big difference on steep slopes. We will be able to see how well this setup works during the King of the Hill ride! 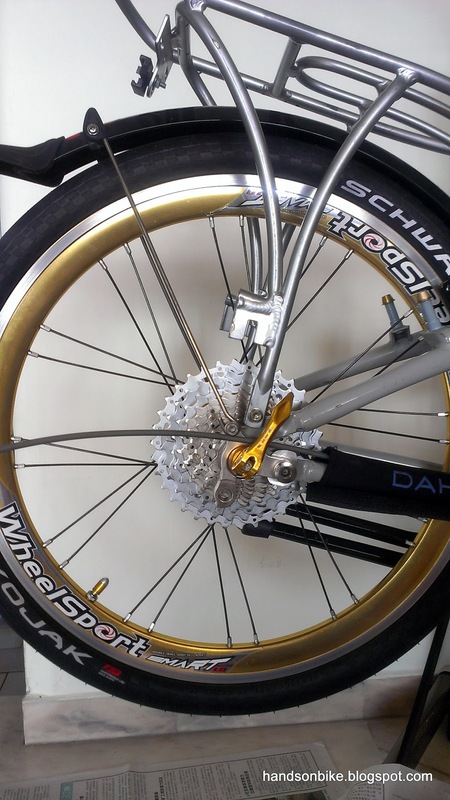 To calculate the gearing inch, you need to know the diameter of the wheel and then apply the formula. Out of curiosity, how do you determine the wheel diameter of a 20" wheel. I understand it is not perfect the 20". Well I just use 20 inches for the calculation. yes the wheel size is not exact, but so are other wheel sizes. 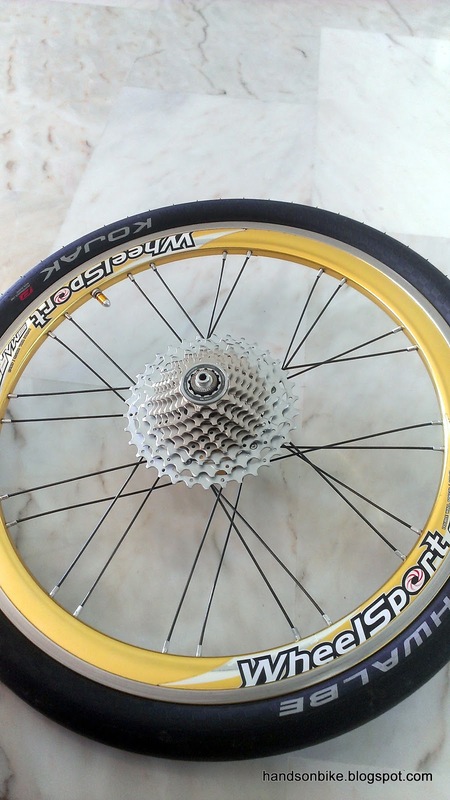 in fact the actual gearing will vary a bit depending on the tire size also. it will be a good guide when comparing different bike set ups. Noted with many thanks, Steve. 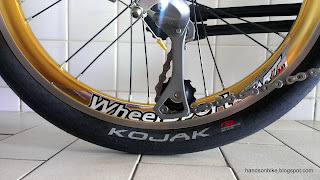 I will use 20" in my calculation of gearing inches for my bike. Hi, do u think an sram x9 10 spd short cage rd will work on a 11-34 cassette with front 53T chainring upfront (1x10 setup)? I meant the stretch & lag of the rd in particular. I think it should be fine. Since you are only running a front single, the short cage RD has enough chain capacity. As the SRAM X9 is a MTB series RD, it should have no problem reaching the 34T sprocket. Just take note of the chain length so that the RD does not get too stretched out in the 34T sprocket. To avoid chain drop, you can either get a chain guard / bash guard, or get those chainrings made specially for front single. Try not to use a chainring from a front double crankset, as the teeth are designed for shifting, thus they are shorter and the chain will derail more easily (because it is designed for shifting!). 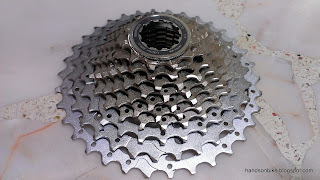 Hello Steve, you mentioned the Tiagra 10-speed 12-30T cassette in this particular post. Where in Singapore can you buy this specific cassette? I'm from the Philippines, and Tiagra cassettes here are commonly of the 11-25T variety. While we're talking about cassettes, I do have a 9-speed 11-32T cassette here...it's a Suntour model, and I think it was originally meant to go on a mountain bike. 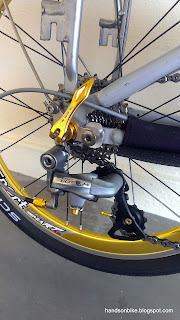 I have the mid-cage Tiagra 4600 rear derailleur and Alivio M430 9-speed shifters here as well. Do you think these three parts would play nice together? Or do you recommend just keeping the RD and seeking out the Tiagra flat-bar shifters and cassette instead? You can check out Hup Leong to see if they have it. They are one of the few bike shops to carry mid range products. If not just get it online. 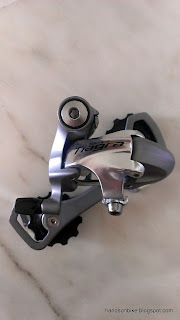 As for the components you have, I would suggest that instead of finding the Tiagra shifters, just get a 9 speed Shimano MTB RD, to go with the Alivio shifter and cassette that you have.